I'm super excited to share today's outfit! I LOVE this sweater! My sweater is another Crown and Ivy fabulous find that I got for Christmas. Isn't this little dog so cute!? 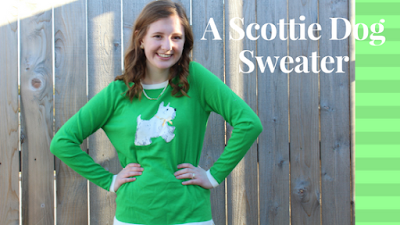 If dogs aren't really your thing I would recommend checking out this post for a similar camel sweater. This adorable Scottie Dog sweater is on sale too! I thought the outfit would be more fun with a pair of black, white, and green printed pants and my favorite mules from Target which I also featured in this post. The mules are actually on sale right now for $11.38! You can shop using the link at the bottom of this post.